There is now no such thing as a customer loyalty as it pays to always shop about. The best deals for energy, for car insurance and other insurances are often held back for those looking for a new deal. It pays to switch providers as there are nearly always the best rates or additional freebies saved for new clients. Those that stay with a company because it is easy and convenient will find themselves paying higher premiums for the privilege.By your gas and electricity is a cost that we all need to endure and switching providers makes sense. Since competition opened up between the providers they do all they can to tempt potential customers to join them. It can take time and patience to go through all the deals and you need to keep on top of it and spend time regularly checking. Although we know this, many of us are just too busy to undertake this on a very regular basis. This is where the Flipper Community comes into force. I shared the idea of Flipper over on Emma and 3 but have now put it into practice. I sat down with my husband (as the bills are in his name) and we quickly inputted our personal details and linked our current accounts up. This took us under 10 minutes and that included running upstairs to get the correct account details! We did this late in the evening and were informed that Flipper would work their magic. The following morning I received an email to say that I had set up the account and then within minutes a second email informing me of the deal that will save me more than £50. The service does cost £25 a year but this is made up in that very first saving of at least £50. 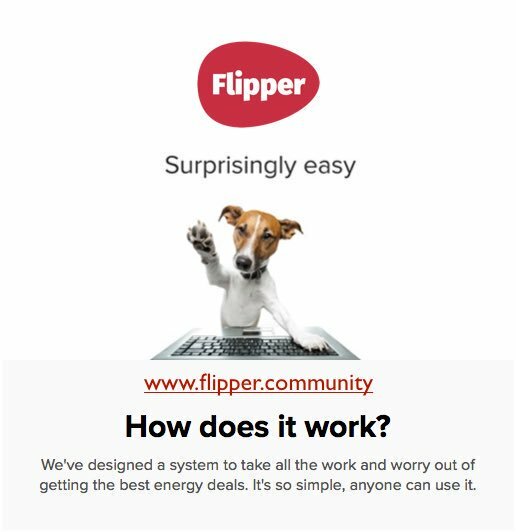 Once your details have been submitted there is no need to submit them again, Flipper will do all the hard work changing your supplier a min of 4 times a year which continues to save you money each time. It really is that simple and you don’t need to think anymore about it. The savings we have made will make our energy a huge £300 less per year. So for an initial outlay of £25 we are much better off financially. This makes a money saver like me happy. It shows that there is no advantage of customer loyalty. We are much better off switching suppliers and benefiting from new customer deals all the time. This doesn’t just apply to energy but to many of our regular spending’s especially insurances and TV packages. It really is switching and Flipper has made this so much easier as it now won’t even cost us time. The services provided by Flipper seems to be wonderful..I am definitely going to give it a try..Thanks! I have to admit that I would initially be put off by the £25 year cost but when you look at the savings you are making, it really does make sense. I need to make some time to look into this more and sort out our finances! We have been with EDF for a few years now but as always when our fixed rate ends I will be looking for all the deals online then seeing which is best before jumping ship. I agree it can take time and patience to go through all the deals, however it’s certainly worth it in the long run!